When it comes to upmarket living in Hong Kong, there are a handful of addresses that are guaranteed to get the nod of approval from the most knowing names in the architect and design community. The Morgan is high on that list. Situated in Upper Mid-Levels, on Conduit Road, the elegant complex is a masterclass in handsome design. And high up on the 30th floor lies the cherry on the top: The Morgan Penthouse. 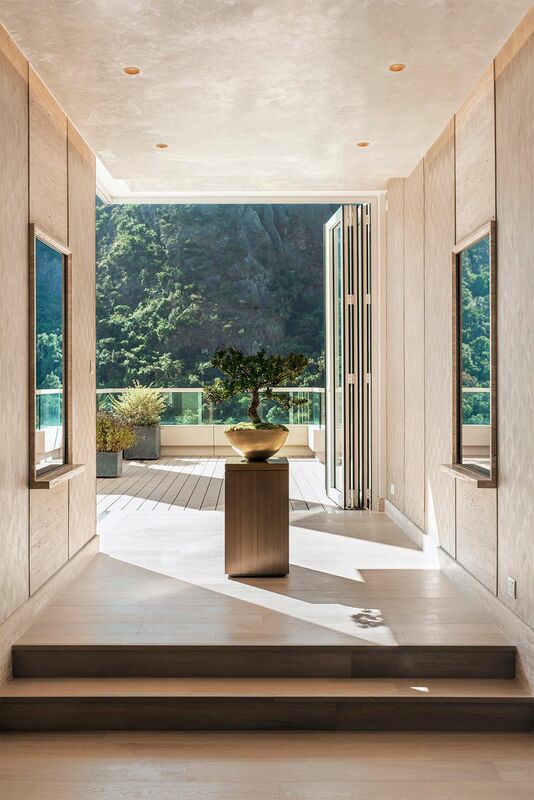 Realised by renowned designer and the founder of Brewin Design Office, Robert Cheng, the almost 4000-square-foot (and that’s just on the inside) residence delivers an outstanding living opportunity in the heart of Hong Kong Island. Cheng is known for his focus on creating an emotional narrative between people and their homes, opting for discreet luxury and imbuing much of his design with a quiet yet impressive attitude; The Morgan Penthouse is no different. We couldn’t resist catching up with Cheng while he was in town showing off his latest project, to discover what design sites across the globe have caught his expert eye over the years. I visited the museum last November and was literally speechless for the day I was there. This is a project that embodies everything that the genius of Jean is – an architect who creates permanent art installations that house functions which we inhabit, more so than building architecture. Imagine exterior spaces between clusters of white volumes (that house galleries), all of which have their own orientation – a plan which takes reference from historical urban contexts of middle eastern cities, all shielded under a shallow dome measuring 300 metres in diameter. A structure composed of layers of intricate lattice sub-structures, filtering natural light, wind, sound and heat, resulting in an experience when under the dome and between the volumes that is unmistakably curated by Jean: theatrical, dramatic, and sculptural. This is a small gem of a project along the arcade flanking St Marco Square in Venice. For me, this project embodies a fine balance between furniture design, millwork design, interior space making, the finest architectural detailing and the articulation of formal proportions that create timeless compositions between various materials and interior elements. Perhaps the most interesting aspect of the museum is the design of its structures and how they are integrated into their natural surroundings. This is highlighted in the museum’s approach which leads through a mixture of man-made and natural environments. The inside of the museum contrasts steel and glass with warm stone and offers panoramic views of the surrounding valleys. A building structure mostly buried under a mountainous landscape of fully grown trees, I feel the Miho Museum is one of the best examples of I.M. Pei’s masterpieces. It is modern architecture at its best, integrating nature, natural light, culture, history and time. Situated in New Mexico, a three-hour drive from the nearest city of Albuquerque, the artist uncompromisingly searched for a piece of land in the middle of a desert where mountains were seen in the distance looking westward. I spent my 40th birthday in a hut for 24 hours with two other couples. The hut and 400 vertical stainless steel poles grounded into the earth in a grid formation spanning exactly 220ft apart from each other were the only man-made structures in a 50km radius. Our task as viewers, was to take in the surreal experience of walking through these poles and observing them at different times of the day. For me, this installation embodies the best things about art and architecture.